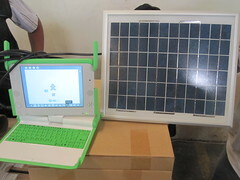 Christoph Derndorfer (@random_musings on Twitter, http://christoph-d.blogspot.com/) is out in Lima with the OLPC project and he’s just posted this image on Flickr. 45,000 of these panels are currently being distributed. I’m hoping Christoph has the time to post a bit more about the panels. Power rating is probably in the 7-12W range by the looks of it. I wonder how much they’re costing. The 24W panel I bought cost over 300 Euro!